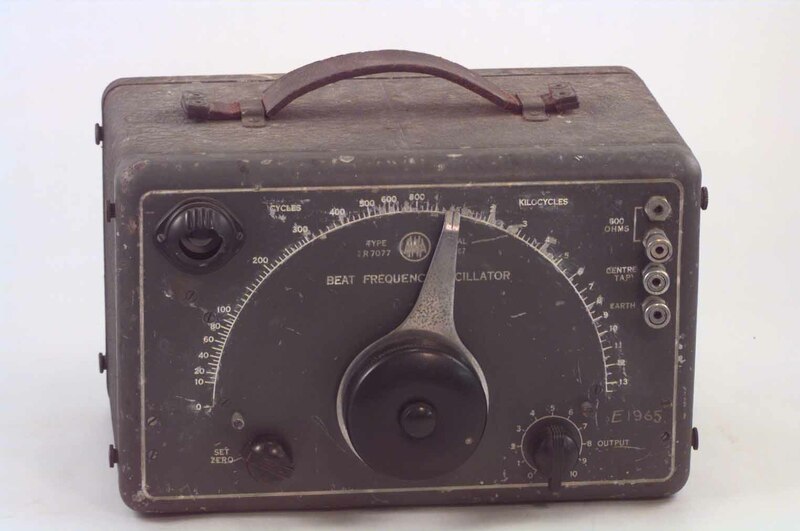 A Beat-frequency Oscillator (BFO) is a device for generating oscillations of approximately sinusoidal waveform by combing two radio-frequency electrical oscillations of different frequencies. The BFO circuit produces an internally generated signal that "beats" against a second signal, producing a waveform that oscillates at a frequency that is equal to the difference of the frequencies of the waves. The difference frequency can be varied over many decades. Established in 1913, AWA is a leading electronics company. Renowned for being at the technological forefront, AWA pioneered the introduction of both television and radio in Australia. This AWA BFO (Type 2R7077, Serial Number 167) uses several evacuated electron tubes, so called, Radiotrons, mainly made in Australia and England, in a pre-PCB (Printed Circuit Board) circuit. It uses a variable capacitor to control the frequency of one of the signals, which is varied by the frequency knob on the front of the unit. The zero is also controlled by a variable capacitor and the output amplitude is controlled via a variable resistor. Still in working order, the BFO encounters problems as the frequency is brought down to approximately 60 Hz, at which point the produced wave is far from an ideal sine wave. Also the frequency drift is quite bad. A beat indicator is located in the top left-hand corner. The earth, centre tap and output terminals are located in the top right-hand corner, with one of the output terminals missing, obviously broken in the past. Enclosed in a steel case with a leather carrying strap (currently broken) the BFO requires an external power source and has a power lead and connector for this purpose.